In what appears to be a horrific incident, 52 year old bicyclist, Alavaro Chavez-Farias, was struck and killed by the driver of a Cadillac Escalade at 8:07 p.m. on Monday in Des Plaines. 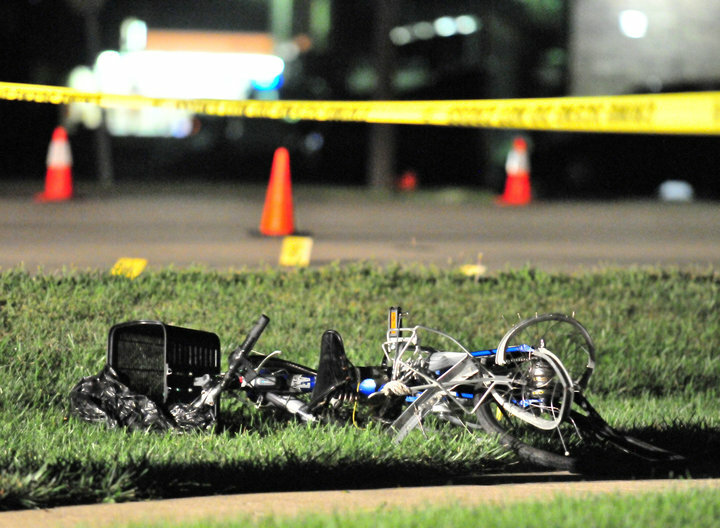 A photograph of Mr. Chavez-Farias's bike after the accident was posted on Facebook by a passer-by and demonstrates that he was struck with great velocity and/or that the SUV ran over his bicycle. The cyclist was riding in the 500 block of North Wolf Road when he was struck by the vehicle traveling in the same direction. Police are still investigating the matter. The cause of the incident has not been reported. This matter was reported by The Daily Herald. At 8pm (after sunset) on an un-illuminated suburban street it's a shame he didn't choose to use the sidewalks clearly visible on a google maps view of that intersection. They would have saved his life.